My ears seem too sensitized and it’s affecting my sleep. For the past 6 weeks I have had my phone in my room – on standby for baby delivery news. 3 of those weeks, while Kristen was hospitalized, my ears were also tuned in to the baby monitor in our room – in case my grandson, who was sleeping upstairs, awoke. I would wake up to the slightest stirring. I even started incorporating hearing the phone ring or hearing my grandson with a croupy cough in my dreams. I would wake up only to realize I was only hearing Wyndham or me breathing. 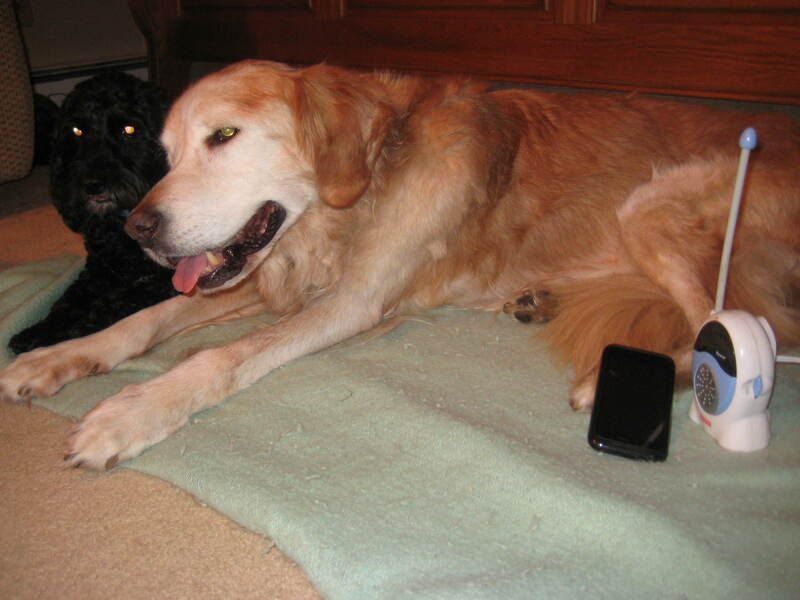 Now, I hear whimpering through the night from Jordan, our ailing Golden Retriever. He used to be so quiet. Now, he is excited when he stands up – and he wants to let us know. He barks when he needs to go out, when he wants water and when he wants another pbj (peanut butter and jelly sandwich – his new fave. He is still not wanting his dog food…hmmm, I wonder why) Last night he began barking for seemingly no reason. It seems he was lonely. Once we brought him into our room he was fine. He just wanted company. Last night I was tempted to put on my noise cancelling earphones (got a great deal at Brookstone Outlet) and just fall asleep listening to Kenny G. Or, better yet…. listening to quietness. However, I need to be able to hear since I’m “on call”. I want to be most sensitized to hearing God. I want to hear him as I read my Bible, and as I ask for wisdom, and as I try to be tuned in to His Spirit. I pray that today I can be “on call” to His voice. This entry was posted in Uncategorized and tagged devotional, listening, prayer by jeanieshaw. Bookmark the permalink.